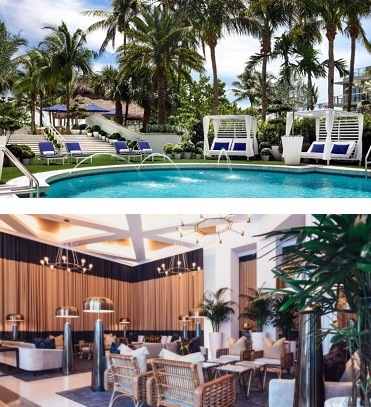 Located in the heart of Miami Beach at 39th Street and Collins Avenue, Cadillac Hotel & Beach Club, recognized as one of Miami Beach’s original and historic Art Deco properties, has undergone a multi-million-dollar renovation. Cadillac Hotel & Beach Club now joins Marriott International’s Autograph Collection, a diverse portfolio of more than 150 independent hotels around the world that reflect unique vision, design and craft. 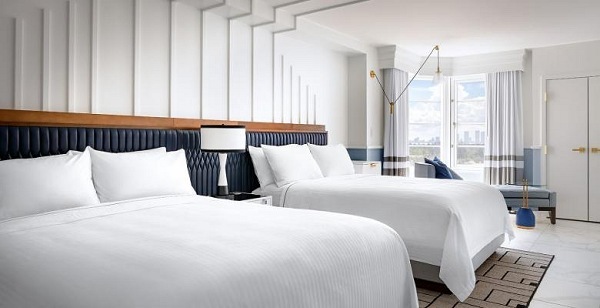 Oceanfront and city view rooms, including 20 spacious suites, are complemented by radiant white stone floors with Art Deco inspired articulation, flattering ambient lighting and subtle gold and smoky blue accents. Together, these design details create a sanctuary that allow guests to unwind in style. The hotel’s signature Cadillac Suite faces the Atlantic Ocean with an expansive 1,100-square-foot terrace, large enough to host private dinners and cocktail receptions. Accented with a plush outdoor living area, the Cadillac Suite has an outdoor dining area and sunbeds for basking in the Miami sun. A state-of-the-art home theater and 65-inch television enhance the entertainment systems of the hotel’s premier suite. At the heart of the Cadillac, the lobby has kept its classic signatures with original terrazzo floors, lush greenery and a wraparound mezzanine balcony overlooking the check-in and lounge area. Egan Miami Beach, the hotel’s lifestyle boutique, is located at the hotel entrance. Offering unique gifts for guests and locals alike, Egan Miami Beach is curated by Kate Egan, owner and founder of Egan Day and Egan Rittenhouse in Philadelphia, PA.
Cadillac Hotel & Beach Club combines the refined, impeccable hospitality of Europe with an elevated local experience that revolves heavily around food, culture and creating connections, adding in the unmistakable, vibrant energy of Miami Beach. A modern, Mediterranean influence can be felt throughout the hotel – from the aesthetics to the ingredients on guests’ plates. The on-site restaurants and bars Donna Mare Trattoria and Bungalow by the Sea, a seaside-inspired destination just off the Miami Beach boardwalk, are the perfect blend of land and sea. The main pool leads to Bungalow by the Sea, a coastal chic destination for resort guests and locals alike to relax with a wide range of craft cocktails, rose and European wines, as well as a raw bar and light fare including simply grilled fish and salads. Inside, Cadillac welcomes Donna Mare Trattoria, offering light, locally-sourced traditional fare and seafood, including Neapolitan pizzas from a wood-fire oven, homemade pastas, simply grilled fish and grass-fed meats. The restaurant’s intimate setting evokes the old-world atmosphere of Italy while embracing beautiful Miami Beach. Lobby Bar, the hotel’s intimate bar, focuses on cocktails inspired by the sea, and also serves light bites and rose flights. The luxury hotel also provides beachside and pool service which includes a dedicated Sun Bum sunscreen bar and a signature shaved ice cart serving complimentary treats daily at two pools – one for adults only and one family pool. For corporate meetings and social events, Cadillac Hotel & Beach Club offers a quintessential Miami Beach backdrop. Several flexible indoor and outdoor meeting and event spaces include a high-tech and high-styled boardroom as well as a beautifully-appointed ballroom that fills with natural light from floor-to-ceiling windows and opens onto an expansive pool deck. Riviera, a flexible-use meeting space, also with bountiful natural light, leads to a grand terrace overlooking the pool. Cadillac pool and beachside gatherings under the palms are destined to become a part of the most sought-after events in Miami’s social scene. 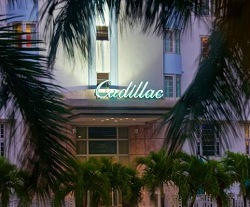 The wedding and banquet menus at Cadillac will include an option to offer a Rose Bar, a first on Miami Beach. The relaxing beachfront setting will put guests at ease while also immersing them in lively Miami Beach culture. With Cadillac Signature Experiences, tailored Miami specific packages which focus on air, land, and sea, guests have the opportunity to feel like they are truly part of the Miami Beach community. Each of these premium and carefully curated experiences is personally arranged by the Cadillac Concierge team, who specialize in customizing guests’ stays. The hotel also provides a pet friendly program offering a complimentary Waggo dog bed, water, food and treats. For the body and mind, the hotel offers a daily fitness class and has a fitness center equipped with Peloton Bikes. With elevated, tasteful experiences designed to facilitate immersion in art, culture and authentic cuisine, Cadillac provides guests with unparalleled, tailored concierge services, several dining options and more. Cadillac encourages and facilitates genuine connections and unforgettable moments for guests of all ages, across generations, for locals and travelers alike.